The sun is shining, there are new leaves, shoots and fresh things happening all around. What better time to try something new? So it's a week of learning... and of course, trial and error. 2, 3 & 4 - all sock related - In my last post I mentioned a Craftsy class I'm taking. It's made me want to try two new techniques immeditely - the mocassin-toe (looks so comfy) and the afterthought heel. I have always made socks on a long circular needle and after giving it a try, I think it is a bit fiddly for the magic loop method - so it's also time to try again on DPNs (...even if they are swapped for a circular when it's time for the foot). 5. New books - I have a few books on the go at the moment. Let's Pretend This Never Happened, by the Bloggess Jenny Lawson, Still Alice by Lisa Genova (for book club) and I downloaded the sample of Divergent last night to see what all the fuss is about. I was enjoying it too, until I fell asleep and the Kindle hit me in the face. 6. New bind offs - My Miss Winkle shawlette for the Spring knitalong is (sort of) finished. I started to cast off using the Icelandic bind-off others on the group have been using but I didn't love it more than my usual sewn bind-off. 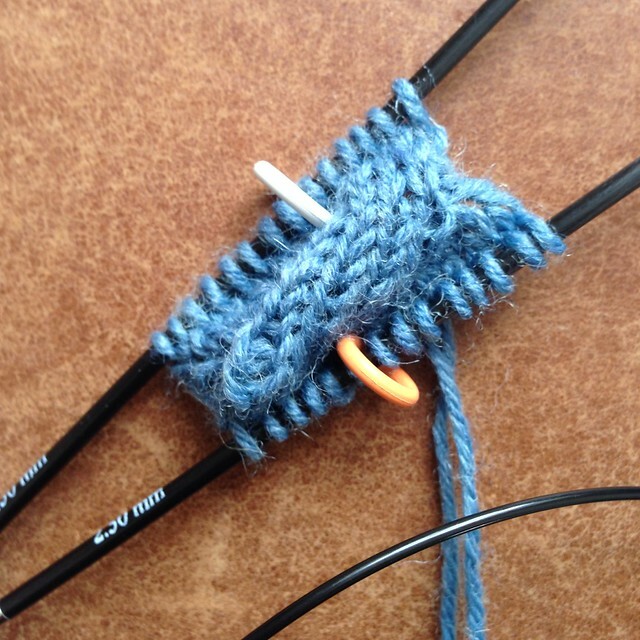 Wanting to try something new, I've ripped it back and am going to try Annie's Knitsofacto bind-off instead. I've been meaning to try this for some time so I'll let you know how I get on in tomorrow's update. Intrigued by the moccasin toe, sounds interesting. New tooth doesn't sound much fun! I am hopeless with a computer pattern I tend to use graph paper when I am designing a pattern. 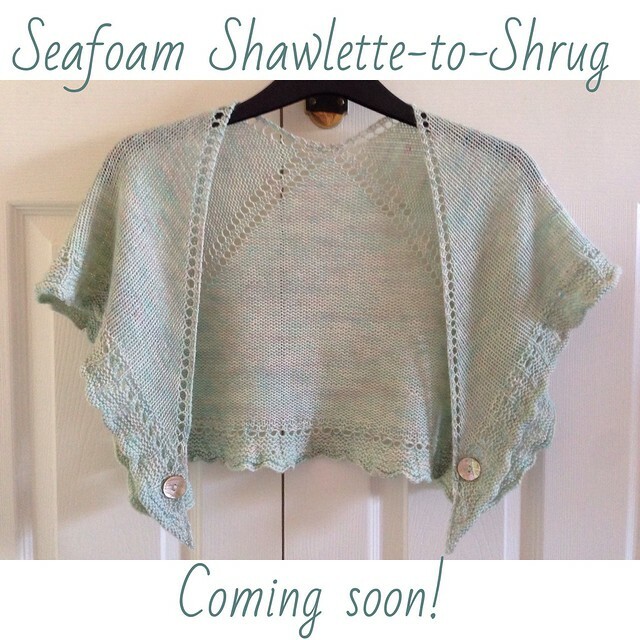 Just loving the shawlette to shrug. Oh no, too bad about the tooth! Your shawl-to-shrug pattern is very pretty and clever, though! Your Seafoam creation is beautiful. I love the button touch. I want to try Divergent for the same reason. I loved the Harry Potter series after the buzz but only liked the Twilight series. The new pattern is gorgeous!! Let us know when it's published. Lots of fun things goin' on with you. Intrigued about the moccasin toe technique. You've reminded me of when I want to take a class, to give Craftsy a whirl. Sorry about your tooth. Ouchie and yikes! How is UK dental coverage? It's stingy over here. I'll take a cracked tooth any day over my sitch. Oh no! I hope you're ok. That must have been awful, I'm not a fan of boat swings. Oh, that shawl is too perfect. So delicate and lovely. Sounds good to be trying some new things! I have several things I wanna try this year. It is a bit intimidating to try something that appears to be rather difficult though -But I guess there is nothing to do but to try. At the moment I am trying my hands on some different crocheting. It is on the easy list of new things..